I knew I had more Silver Scripts somewhere and I came across this one yesterday when thumbing through a stack of cards on my desk. This one was a Steve Shields and it brings the collection total to 16. These cards are growing on me more and more with every one I add to the collection. There's just something about laying them all out on the table and looking at them together that I can't explain. 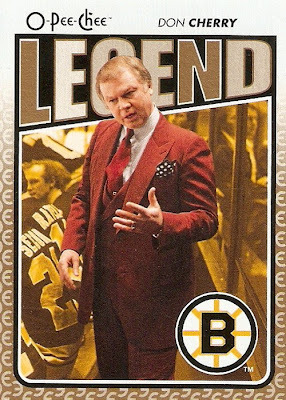 There are probably a few more of these hidden in other stacks of cards, but when I find those it will be time to start sifting through singles at card shops and shows, as these are usually pretty cheap. 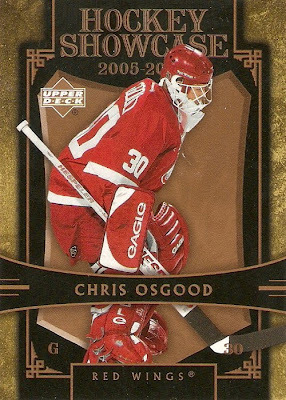 in addition to the one pack of OPC, I opted for another pack of 2009-10 MVP as I have only bought one or two thus far and I couldn't pass on the $1.59 price tag, plus its a pretty nice looking set. Not the greatest insert in the world, but it's a pretty neat idea. The set consists of 20 cards total, nine players from each team (Boston & Philly) and one card for the city of Boston and one for Wrigley Field. Never thought I would see a baseball stadium on a hockey card. The only thing I did not like about this pack was the fact that all eight cards were slightly dented on the bottom left corner. It's fairly noticeable on the scan of the Savard with the green background. More bottle return money means more free hockey cards. I decided on something I haven't bought any of yet, that being 2009-10 OPC. I've really begun to like this set lately, so why not for only $1.59? This Legends subset card is probably the only Grapes card in my collection at this point, but it's a cool one at that. Gotta love the red suit against the yellow background. I also like the way the fill and border colors of the word Legend changes from left to right. These rainbow parallels are supposed to hit one every eight packs, so I think I did pretty good with this one. The scan does this card no favors at all, they're really nice looking in person. Also, they're glossy front and back unlike the standard base cards. All in all, I would say I did pretty good for one pack at $1.59, a retail pack at that. 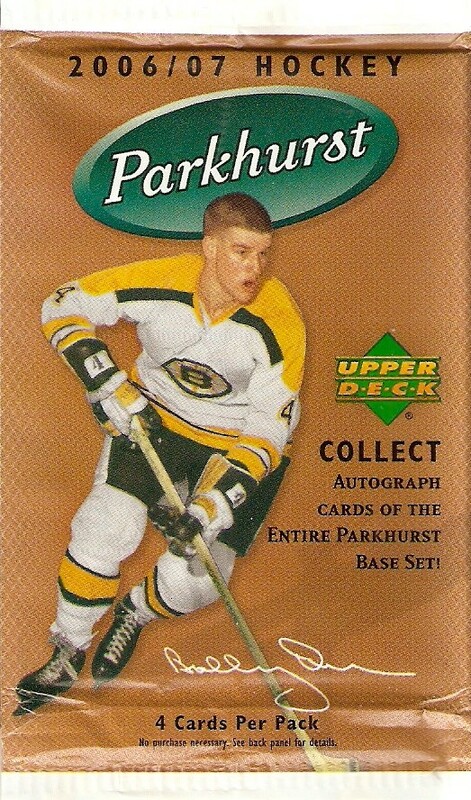 I could see myself going for more of this stuff as prices come down, even just for the rainbow parallels. I went to Target the other night and planned on stopping by the trading card aisle on the way out like I usually do. Well, that never happened. Why? There were eight shopping carts full of re-shop (that's code for stuff people didn't want, I know, I used to work there) blocking the entire aisle. Rather than try and move the stuff I just said forget it and left. I know it's a retail store and they could care less about trading cards and the people who actually buy them, but it was still annoying. I'm just going to take a guess and say that you wouldn't catch them blocking the movie or video game sections with eight carts of re-shop now would you? Anyway, enough ranting, does this happen to anyone else when looking for cards at Target or other retail stores? 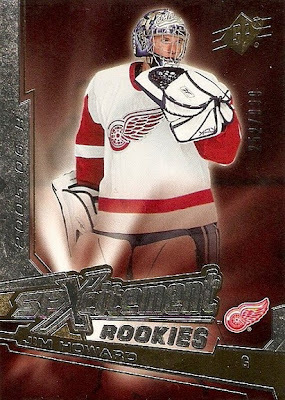 Now that I've got a pretty good start to my Jimmy Howard collection, at least in my mind, I thought I would dedicate a post to Jimmy Howard the goaltender and why I decided to start collecting his cards in the first place. As far as choosing to collect Howard, I'll let some of his work do the talking. The first is just a great compilation and the other two are some of my favorite moments from last season. Gotta love Jimmy going at it with Crosby. I think that little incident is one of the reasons a lot more people here in Detroit became Howard supporters this past season. Other than Jimmy being the starting goalie for my team, I think it's great than an he's American-born goalie that went the NCAA route to the NHL, plus he's got a really cool mask. 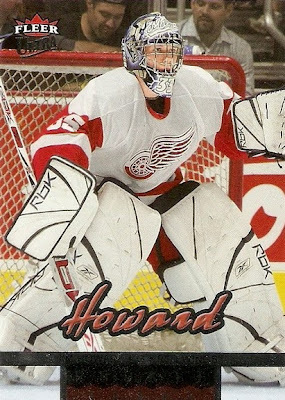 Then there's my whole fascination with goalies and goalie cards in general, so Howard fit perfectly with the direction I've taken my collection lately. 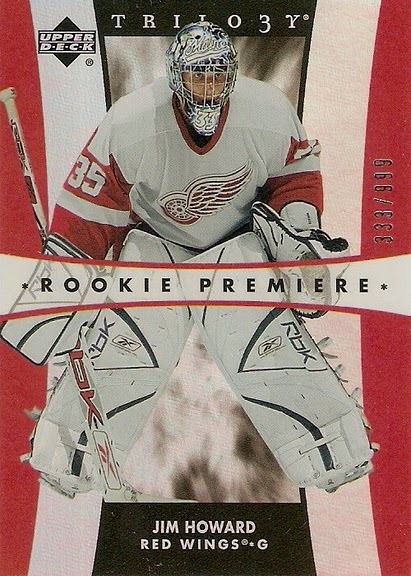 The other cool thing is that his cards aren't all that expensive, compared to some of the other rookies in his class. 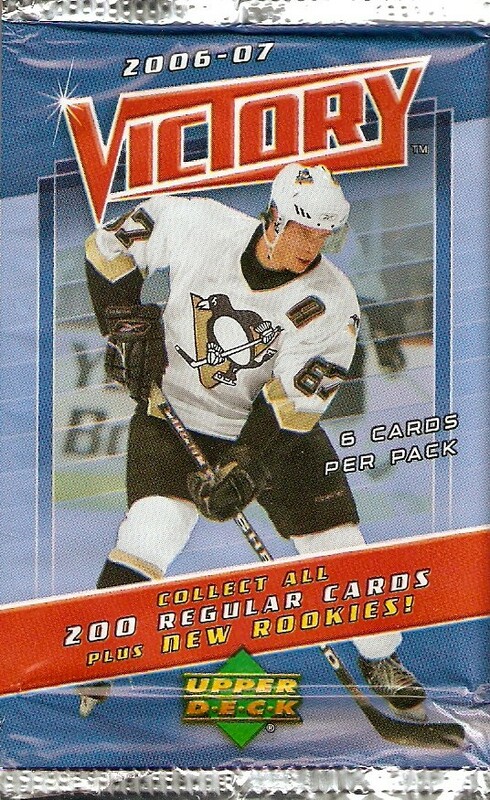 I've decided to go after all 220 of the 1999-00 MVP Stanley Cup Edition Silver Script parallels as well and thought I would start another label for them, so here's the first update for that set. I don't know if I'm going to count the Sonnenberg though, there is a really nasty kind of crimp in the back of the card that reads through right to the front, so I may look to replace that one. I've added another tracker to the sidebar on the blog too. It looks like I have got a ways to go, but I've got plenty of time and this particular master set will always give me something to look for. This pick brings back both good and bad memories. 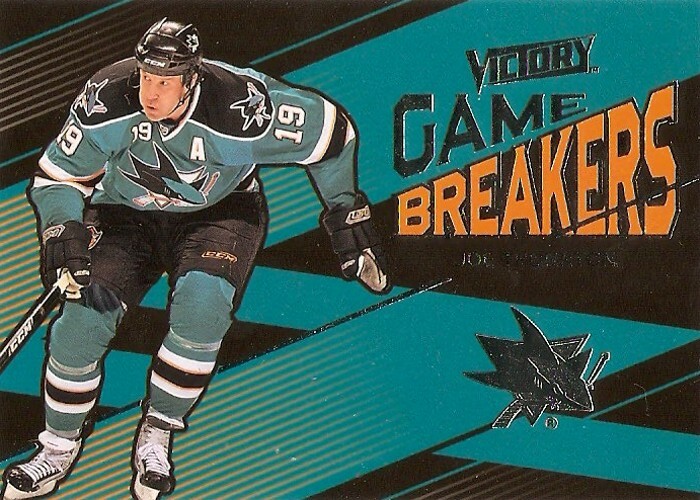 The bad would be a year without hockey and the good would be the return of hockey for the fall of 2005, that's where this set of cards come in. 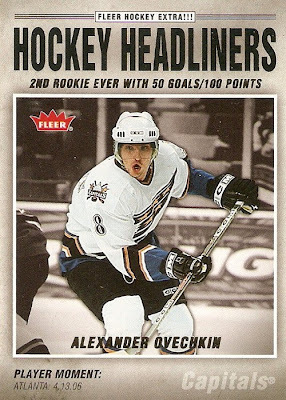 I don't remember exactly how this set came about, but with hockey coming back that fall, Upper Deck put out this set of cards for free, all you had to do was register online and they sent some to you. 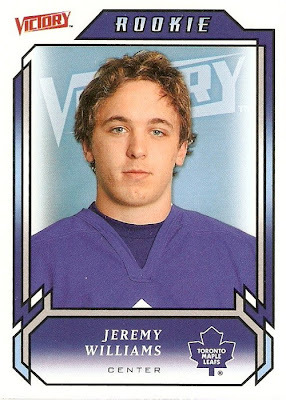 I also don't remember how the registration worked, how many cards you got at once or anything like that, but I ended up with about 15 of these cards and they're all pretty sharp, especially this one. Even though these were given out for free, they do look pretty good. I really like the unique patterns in the four corners and the borders. The player image really pops on these cards with the lack of different colors in the design, so that's definitely a good thing. I love the fact that I finally have a card depicting his awesome mask from last season, the one with the Mustangs and retired number speedometers. 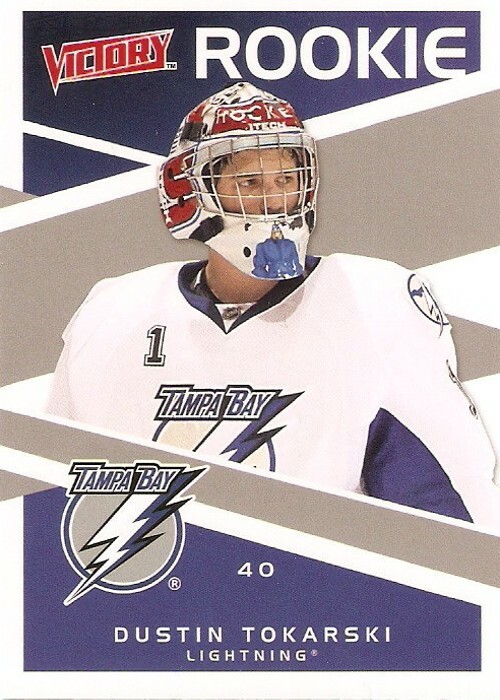 All of the other cards either feature his old Maine mask or the octopus one from previous call-ups with the Wings. I think I went in the right direction in starting the collection. I know because I was more excited about this plain old base card than other high end inserts like the Gilmour jersey from my last pack of ICE. 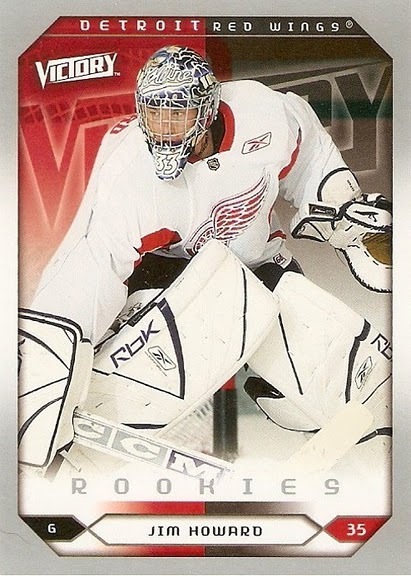 Hopefully Jimmy has a few more base cards this year with being the starter for the Wings last year and getting them into the playoffs. Panini coming into play hopefully means a few additional base cards. I went to Walmart the other day with some more bottle return money in hand and decided on a rack pack of 2010-11 Upper Deck Victory. I'd seen plenty of previews and thought I'd try out a pack or two. 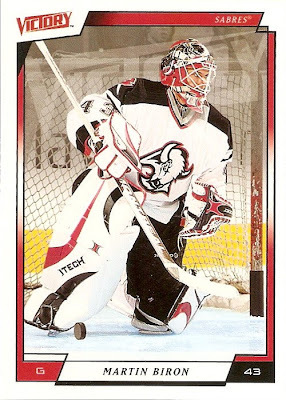 This was one of those rack packs with two 18-card sections, so I'm not going through the trouble of scanning each and every one of the 36 cards, just some of the better cards from the break. For some reason I really like the base card design this time around, the last few Victory base set designs have been awful with the giant Victory logo behind the player, so these are a big improvement. They're just the base design with the white space changed to red. I like them, and its a plus that they only come from the retail packs. I only pulled two and the other was Matt Stajan. 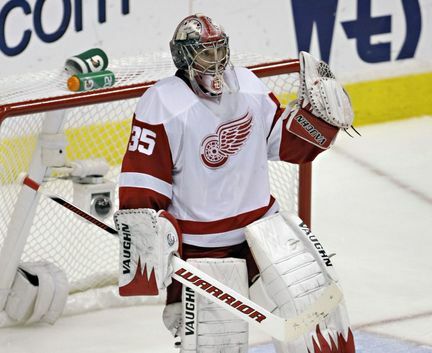 Never heard of Dustin Tokarski, but he does have a pretty cool looking mask from Spokane. These cards are pretty busy on the front, but that's ok because they differentiate themselves from the base design. I also pulled two of these, the other was Clayton Stoner. I actually like this set for some reason. The diagonal lines may be a bit much but they work. I really like the fading of the player image from color on top to black and white on the bottom. 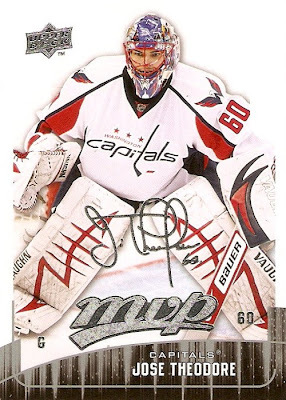 Again, I kind of like this set, with all of the silver foil and all, but the diagonal lines are a bit much. I do like the use of the team colors though, it gives the set a little variety throughout. 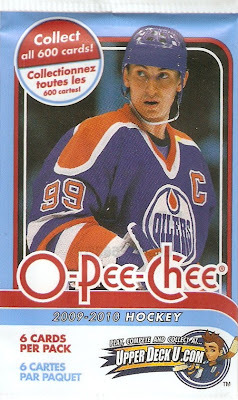 All in all, it was worth the $4.98 just to get going with the 2010-11 hockey card season. Victory was good, now I can't wait for Panini to release Score to be able to compare the two directly. I've been sitting on this project for a few months now and finally got around to putting the finishing touches on the design. 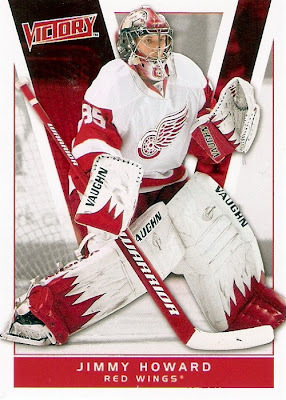 As the title says, these cards feature goalies masks from Hollywood films. 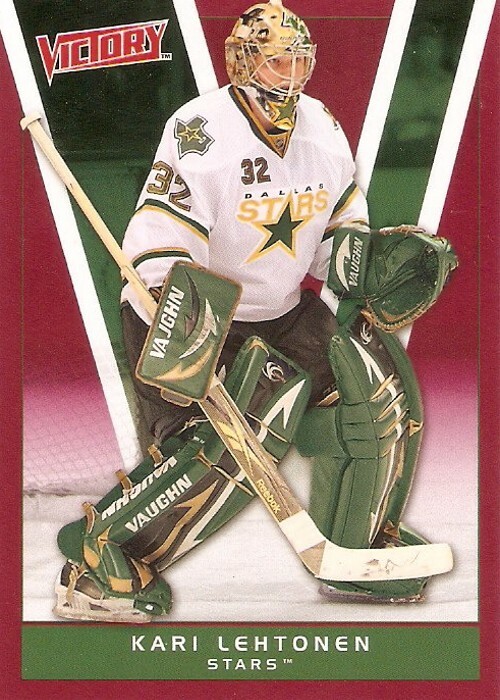 I got the idea for the set after reading the article 13 Goalie Masks in Pop Culture at Gunaxin Sports. 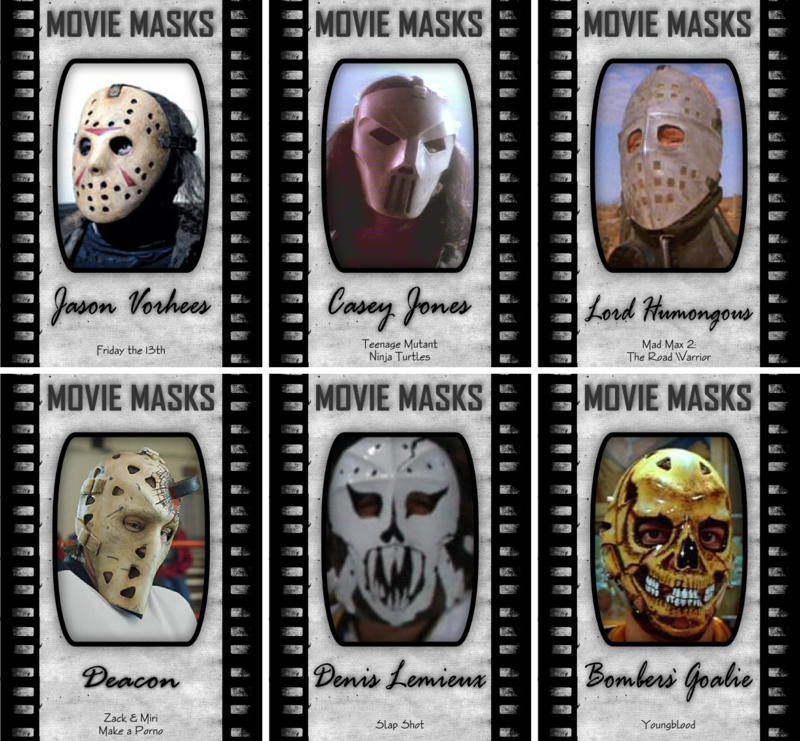 I was hpoing to come up with a full nine, but a few of the masks I didn't care for so I settled on these six. 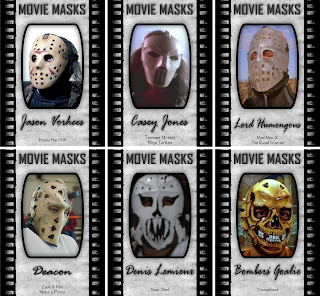 Obviously, Jason Vorhees is the most recognizable of the group, probably followed by Casey Jones from TMNT and Denis Lemieux from Slap Shot. The Deacon mask from Zack & Miri is pretty cool too. It's kind of cool that four of the six are actually from non-hockey movies (i.e. Zack & Miri and Mad Max), while you can't go wrong with Slap Shot or Youngblood. Part of the problem with this set was finding decent quality images of the different masks, as some of them are simply screenshots from the film (i.e. Lemieux and Jones). If anyone has any suggestions, knows of masks I missed, or has better quality images of these six, let me know as I really want to have nine of these to have at least one complete page. These are the last three packs from the value pack and I saved them until last for a good reason. One of these packs made the entire thing more than worth it, well at least to me it did. That last card made the entire value pack more than worth it. 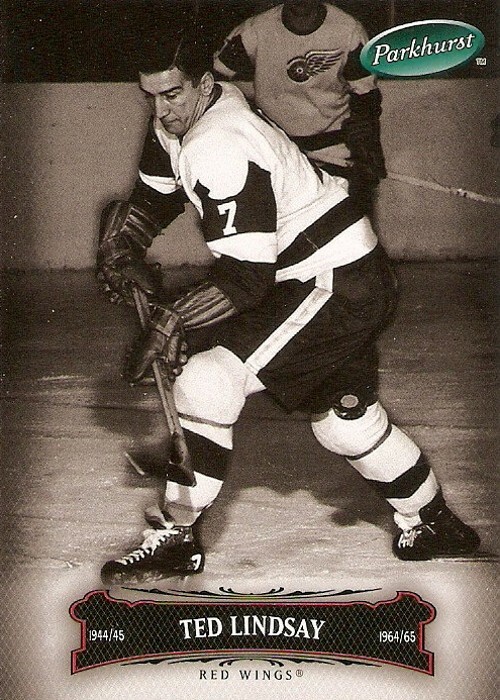 That has to be one of the nicer looking 'graphs I've pulled in a while, its up there with this Jean Beliveau from another previous value pack. I'm sure it would also fall under the scribe category over at My Hockey Card Obsession. There is just something about the old-timers having far superior signatures to the players of today. All in all, I'm glad I decided to spend the $10 on these 15 packs. I got some nice base cards, a few cool inserts, and this awesome auto. Doesn't get much better than that. Same as with the Victory packs, I want to combine the three of them into a single post. 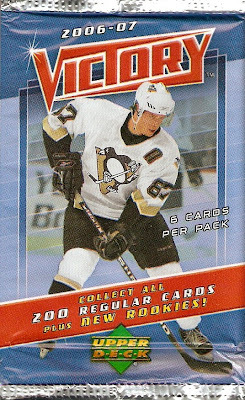 I've gotten a few packs of this in the past, and like Victory it's one of the lower-end releases, so I couldn't expect much. 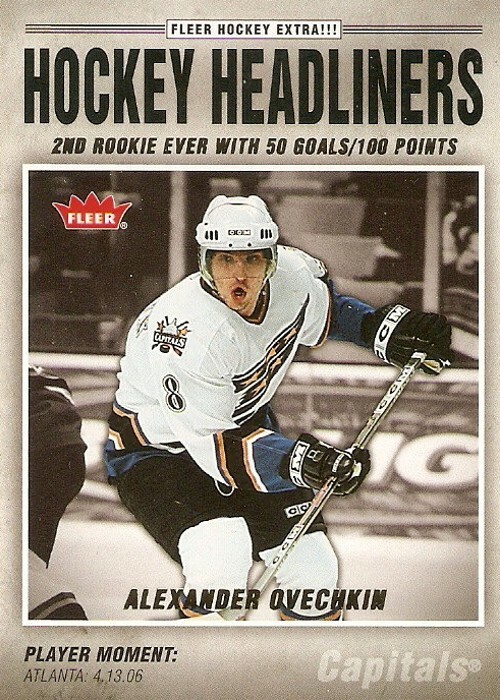 These hockey headline cards a kind of a cool idea, especially how they focus on a specific moment. I really like the design of these inserts, especially the color image on a black and white background. 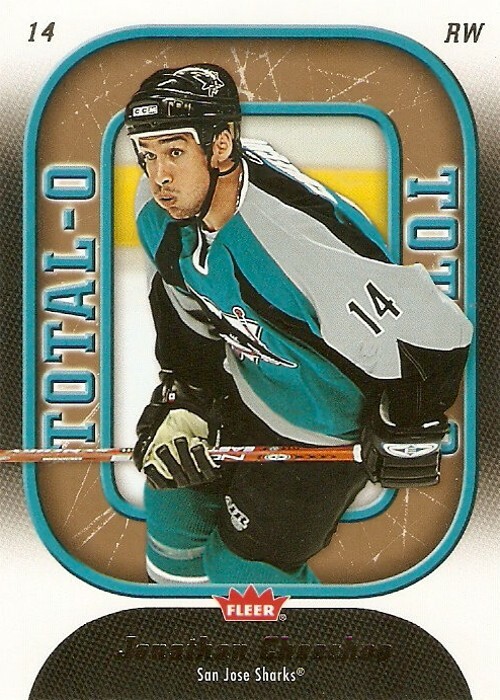 These Total-O cards are average at best. One thing I do like is the golden ice looking pattern inside of the O and the way the outer parts of the card are dull while the rest is glossy. 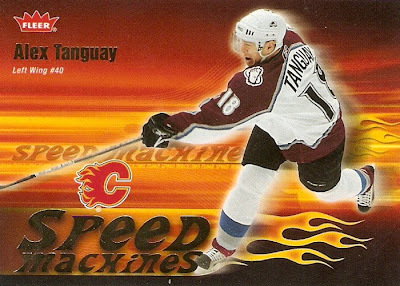 The speed machine cards are kind of cool with the trailing flames and the blur effect to add the illusion of speed. 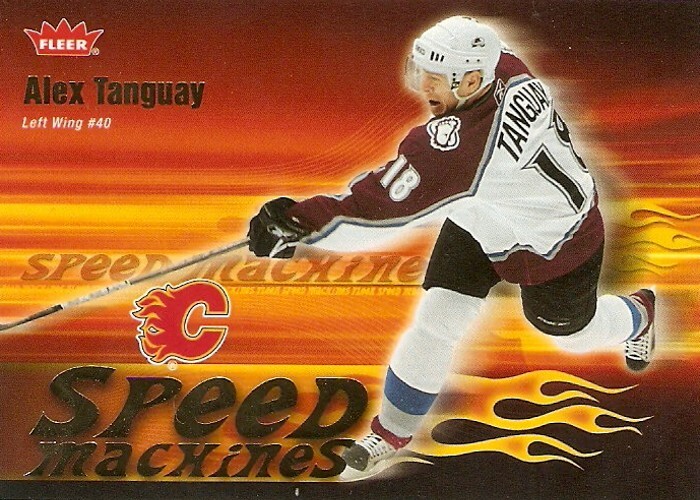 This card is just horrible though, would it have been that hard to leave the Avs logo there? It's been a little while now since I've posted a break from the 15-pack value box from Target. It's taking a bit longer than I thought it would to post all of them. This post will cover three packs from the box as it's getting to be too much work to post each one individually. 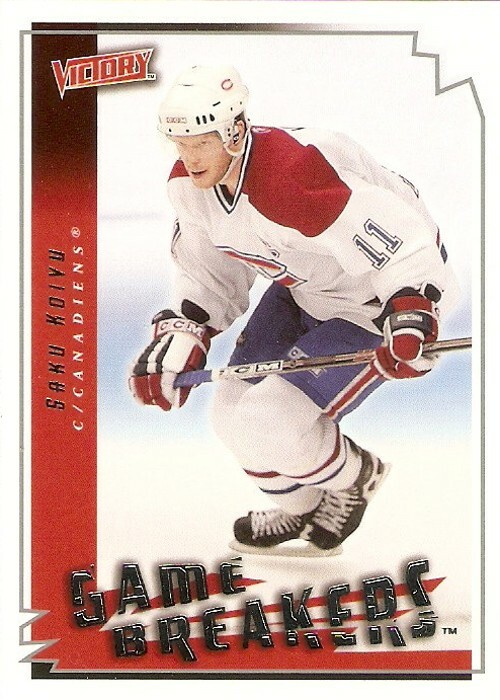 Pretty basic stuff in the insert department, just the one Koivu game breakers. I like that though, it makes for a cheap and easy set to build without wasting money on pack after pack hoping for big hits. I pulled two rookies from the three packs. There was this Jeremy Williams and Steve Regier. 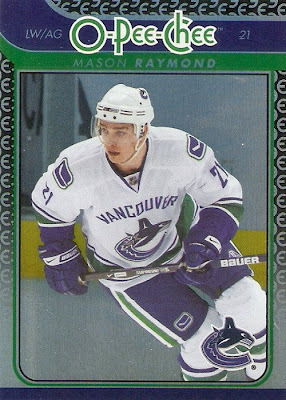 Nothing special, but hey a rookie card is a rookie card, right? I'll admit, I splurged a little bit this time, at least according to my current self-imposed budget for cards. 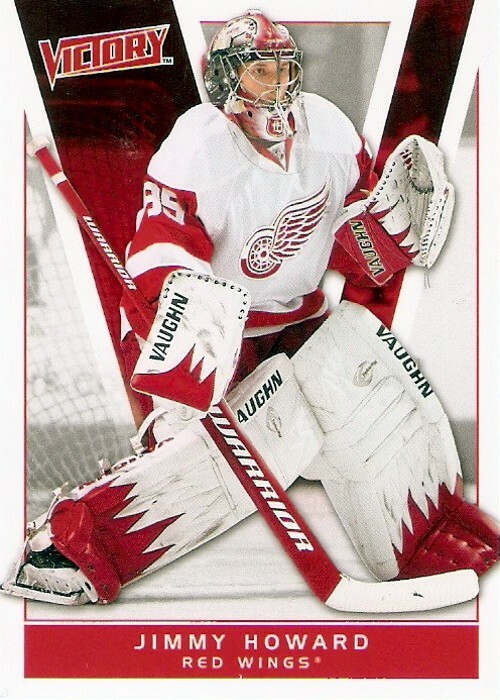 I've added five more cards to my Jimmy Howard collection for only $12 plus shipping. 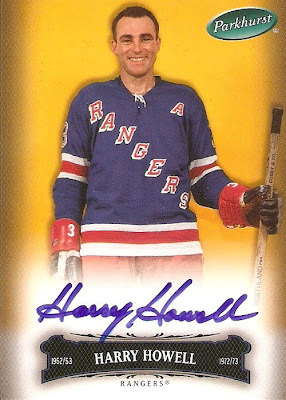 I came across a lot of four Howard RC's, three that I don't have, for only $0.99 and another auto for $0.99. As usual, they came down to a last minute bidding war, but I came away with both at a great price. 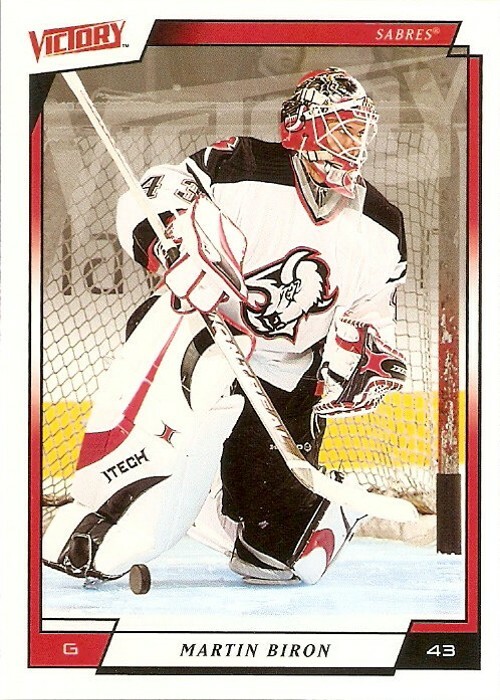 The four RC's included 2005-06 Victory, Fleer Ultra, SPx (252/999), and another Trilogy (333/999). 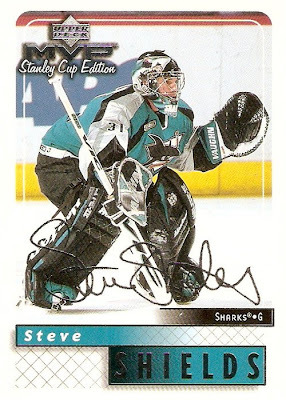 The auto is an authentic Goaliegraph from 07-08 Between the Pipes. I'm really liking the Goaliegraph, it's the first Howard auto I've added to the collection, but definitely not the last. He doesn't have that bad of a signature, which is definitely a good thing. A lot of signatures today are just awful, but that's not the case here. So now the collection now stands at five different cards, six total. I know that sounds lame, but I do have to start somewhere. Now that I've got some RC's and an auto, its time for some game-used stuff. I really hope he gets some more base cards for the 10-11 season. There is only one or two I've seen that don't show him wearing his Maine equipment. The only one confirmed so far is 10-11 Victory. 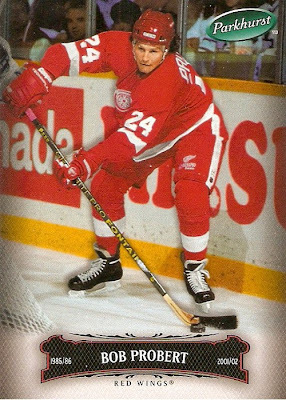 I came across this Johan Franzen card from 09-10 Upper Deck and thought it would make for a good topic here on Card Boarded. 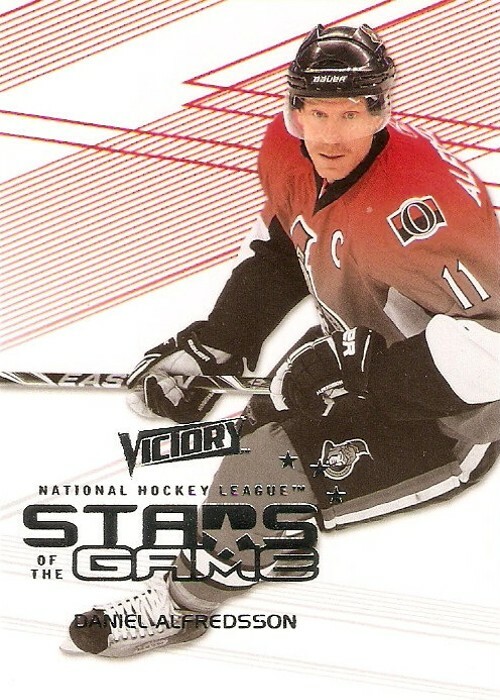 It features an awesome moment from the 2009 Stanley Cup Finals when Johan Franzen checked Sidney Crosby into the boards at center ice during the second period of game 7 between the Red Wings and Penguins. Now that you've seen the moment "captured on cardboard" you can watch it over and over again in real time thanks to YouTube. The photo shown on the card was taken right around the 0:13 mark of this video. I love how the crowd erupts when they realize it's Crosby limping to the bench, it shows just how much Wings fans hate the guy. It's always fun to have a villain in sports. I'm on the lookout for some more cards that feature these kind of YouTube moments, the Franzen just caught my eye right away when it came out of the last pack of 09-10 Upper Deck that I bought. There has to be a lot more just like this. 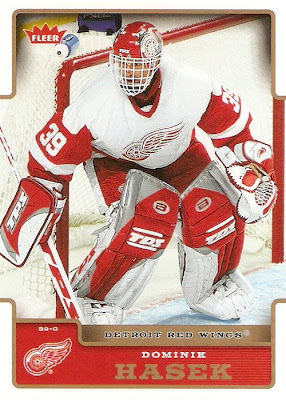 This pick isn't about showing off a cool card or anything like that, it's more of an example of something I hate to see from hockey card manufacturers. Just take a look at it and you'll see what I mean. What's wrong with this card? It's a problem I see too often with jersey cards lately. 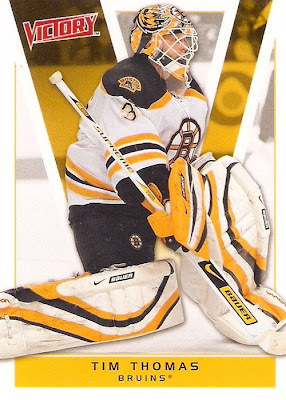 The jersey and the picture don't match at all, which really screws up the aesthetics of an otherwise nice looking card. In most cases the issue is a newer picture with an outdated jersey. In this case, somehow UD was able to cut up a game-worn Blue Jackets jersey and still use a picture of Peca with the Leafs. If he played a game for Columbus in that jersey, shouldn't there at least have been some pictures of him wearing the blue and red? Maybe it was "event worn", don't know for sure though, I don't have the card on me at the moment to check the wording on the back. 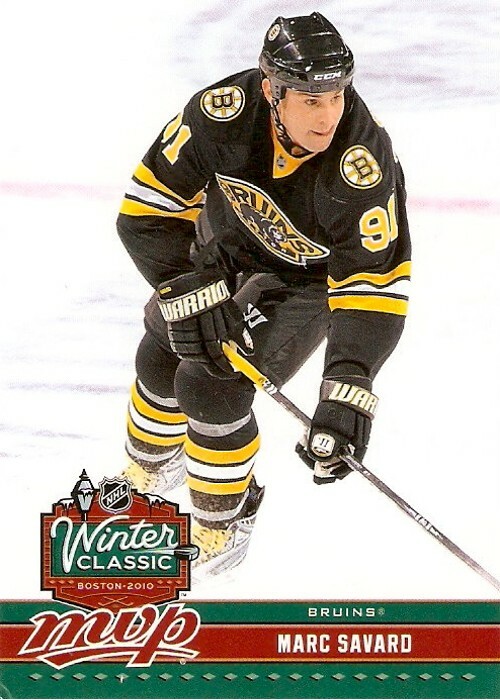 I think manufacturers should make an effort to match the jersey and picture whenever possible, I understand in some cases it can't be done, but I believe I read somewhere they are not required to or something. 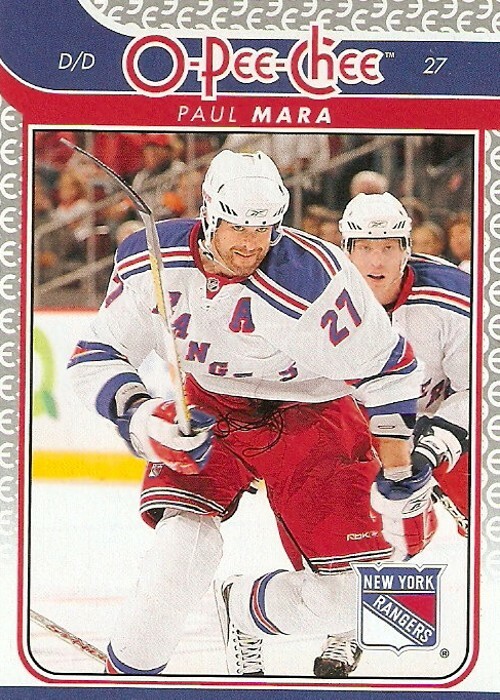 What's your opinion on mismatched jersey cards? No, I didn't misspell mattters, it's just the name of the website I'm referring to. The other day I was checking the stats for Card Boarded on the Blogger dashboard and noticed one of the referring sites was http://hockey-cards.mattters.com/, so naturally I clicked on it. I had never heard of this site before. Apparently they put together lists of websites with similar content (i.e. 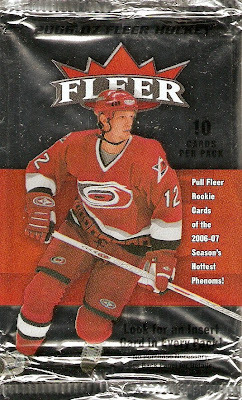 hockey cards in this case with Card Boarded), which is a pretty neat idea in my mind. "Mattters offers easy, single-click access to high quality, real-time, news and stories about the thousands of topics that the major news organizations ignore, but which really, really matter to the rest of us. Each website and tweep is hand-picked by our staff after laboriously researching, examining, poking, probing and dissecting it/them. Those that are consistantly the most interesting, the most relevant, that have the nicest photos and in-depth news or interesting speculations are preferred. We don't care if a website is a major website or just has a few dozen visitors each month - if they have great content, we love them! Its all about helping everyone 'follow their interests'. We hope to make this so easy and fun that we can follow interests we never knew (or had forgotten) we had!" I noticed a few fellow bloggers are there and I wondered have you ever heard of this site and did you know if your blog was part of it? I've never really collected any sets in particular, I usually happend to just accumulate them through mutiple box breaks of certain products. The only exceptions would be my recently started MVP Super Script and Gold Script parallel sets. I was on SCF the other day and one person's signature listed the status of their master set. 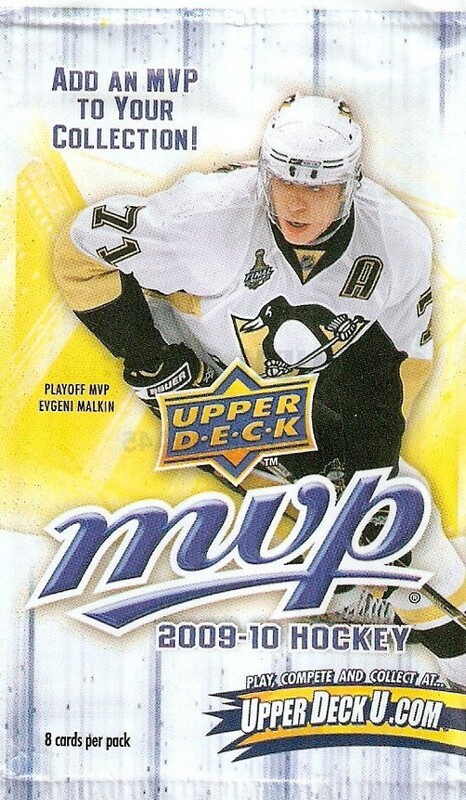 That got me thinking about my MVP collection and possibly collecting the entire base set with parallels. I know for it to be a master set, I would need all of the inserts and what not, but I'm leaning towards the 220 card base set and all three parallels: Silver Script, Gold Script and Super Script. I've thought about pursuing the Silver Scripts in the past, which are not numbered, because I have plenty of them from past box and pack breaks. They're the most common and ususally pretty cheap. With the Super Scripts and Gold Scripts alone, I'm trying for 440 cards numbered to 100 or less. The base and Silver Scripts would add another 440 non-numbered cards brining the total to 880. I don't think the base set iteslf is an issue, I probably have the it finished off and then some already, it just needs to be organized. That leaves me with approximately 600 cards left to track down. I should have plenty more time and money to invest in collecting when I finish college later this year, so I think I may stick with this one 'master' set collection to compliment my one player collection. Maybe I'm aiming too high at this point, but the way I see it is pursuing a set like this will be a very, very long process, and that's fine with me because I will always have something to look for.